1.Upgrade your Bitpie to the latest version which greater than 3.2.9. 3.Choose the nodes that you want to vote for in the nodes page (you can vote no more than 30 nodes). When you finish choosing the EOS nodes, click Vote. You can add more votes in the vote page, “please input how many EOS you want to pledge”, then click submit. Available amount: the number of tokens that you can vote (and also the pledged amount); add votes: if you have available balance in the wallet, you can add more pledge to vote, you can add your available amount by pledging the EOS in your wallet. 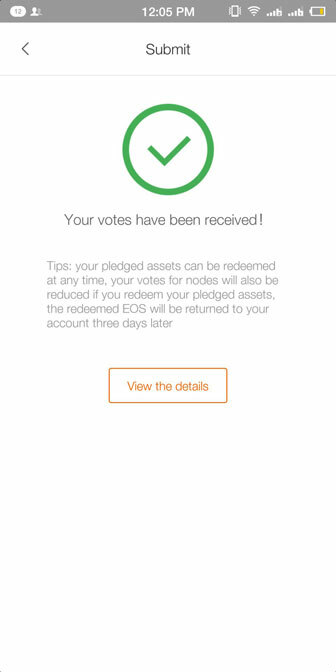 5.When you click the Submit button, you will find a notice said “We find you have voted for other nodes before, your previous votes will be redistributed to the current node if you confirm this vote” (This notice only appears when you have already voted for other nodes before), then click Confirm. 6.Your votes will be received after you input your PIN code. According to the regulation of EOS.IO: During the snapshot period, for those accounts that hold less than 1 EOS (ERC-20 token), even though the users have done the mapping, the snapshot has not been taken. Thus, these accounts cannot import the EOS wallet and the EOS token they held before can neither be transferred to the mainnet. The total circulation of EOS token is 1 billion, but after the launch of the mainnet, the mainnet can only be launched formally after all the EOS holders voting for 150 million votes. The pledged amount cannot be redeemed before the 150 million votes be completed. For example, if you should have had 10,000 thousand EOS in your wallet, but actually there are only 10 EOS show in your wallet, that is because the rest 9,990 EOS were turned into pledged amount automatically, and it cannot be redeemed before the formal launch of EOS mainnet. As long as the votes exceed 150 million, the users can redeem the EOS and the redeemed EOS will be returned to the wallet 72 hours later. You can vote in Bitpie only when you hold your EOS (ERC-20 token) in the Bitpie wallet.